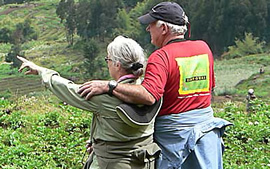 A 1 Day Rwanda tour to hike Mount Bisoke is one the thrilling experiences you should not miss on your Rwanda safari. Travelers hike and descend on the same day hence a chance for short time travelers. Mount Bisoke stands at 3,711 meters and s one the 8 volcanoes that make the chain of the Virunga volcanoes. Wake up very early, have breakfast and transfer to volcanoes national park. Gather at the park headquarters, attend a short briefing about hiking do and don’ts ad then transfer to the hiking starting point with your packed lunch and enough drinking water. The hike takes roughly 4 hours to reach the summit and 2 hours to descend. 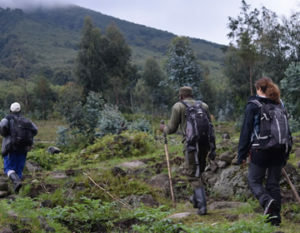 You will enjoy the fresh breath at the volcano summit with spectacular views of Kigali city, neighboring countries and volcanoes national park.